Whether you are looking to buy, sell or just learn more about the rich heritage of the American Cowboy, you’ve come to the right place. 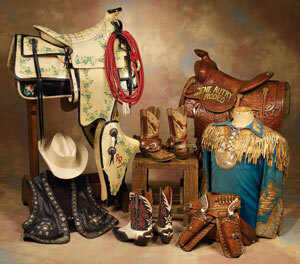 Since 1988, High Noon has been a world leader in promoting all aspects of the Western Americana market. Our important and highly valued relationships with consignors, clients and dealers have integrated us with the Western Americana community. It is you whom we are dedicated to giving the best collecting experience possible. Our eMagazine Smoke Signals, helps educate you and answer many questions your may have about auctions and material. It also gives you a voice, a place to share your stories and ideas. We welcome the opportunity to work with you in purchasing, taking your item or collection on consignment, or advancing funds when necessary. In addition we will appraise your piece or entire collection. Our relationship with the major western museums across the United States have allowed us to gather extensive background and history of the pieces we sell and appraise. It is you whom we are dedicated to giving the best collecting experience possible. Call Us at (310) 202-9010 or use the Contact Form and tell us about your pieces. We'll have a discussion about how best to proceed, tailored to your specific needs. Watch exciting footage as one of only two known, documented saddles belonging to Emperor Maximilian I (1832-1867) of Mexico sells for a record setting $230,000 at the 20th annual High Noon Western Americana Auction. For over 20 years, High Noon has been the most powerful force in the world of Western Americana sales and collecting.